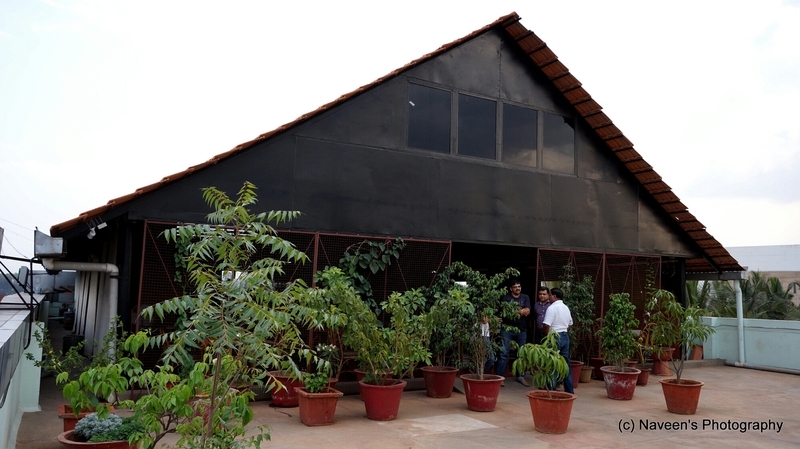 Terminus for Traditional Andhra Style Cuisine – Coringa, Yelahanka, Bengaluru. Coringa was in my wish list from very long time and I just couldn’t visit, even though Coringa is on the way to my home town.My fellow foodie friend (Vinay Bhat) booked a table and enabled me to change my status from “Wishlist” to “Been here”. Coringa is a Roof Top restaurant with huge dining area and a vast open Kitchen. People might not like the ambiance, because there is no fancy decor inside. Bamboo dining tables and exposed bricks give a very rustic look. I found it very homely and felt that dinner would’ve been more enjoyable with the cool breeze on the open terrace. I had been to so many Andhra Style restaurants and I found this place is unique because dishes names are most like we use at home and they specialise in East Godavari (Coastal Andhra) Cuisine. 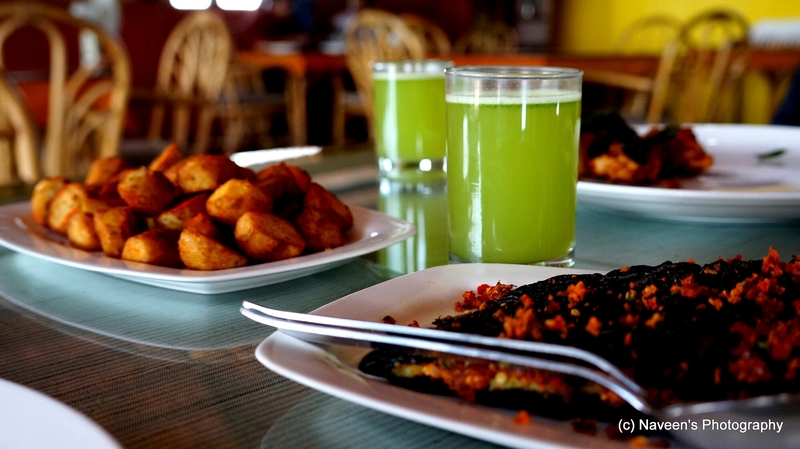 I bet you will not find these dishes anywhere in Bangalore and there was a perception that Coringa is an Oasis for Seafood lovers, but according to me it’s a heavenly place for vegetarians! Veg Options might be less in number, but you will not be disappointed with any of the dishes. I feel Tradition is a word which had come from a restaurant like Coringa. Service is another USP for this restaurant; folks are courteous and have knowledge about the dishes. They are well trained with an attentive expression on their faces. Our food journey started with Tomato Rasam and Nimmakaya Rasam (Lime Juice with Mint and Honey) as a Welcome drink followed by multiple appetizers like Chama Dumpa Vepudu (Arbi), Stuffed Kakarakaya (Bitter Gourd), Bangala Dumpa Cashew Vepudu (Potato and Cashew), Dibba Rotti (traditional bread from Andhra), Mirapakaya Bajji (Chilli Bajji with stuffing) and for main course we ordered Plain Rice, Mamadikaya Pappu (Mango Dal), Kandi Podi Rice (Spicy Lenthil Powdered Rice) and Veg Biryani. My Non Vegetarian friends ordered Grilled Seer fish, some Chicken Starters and Kheema Biryani and they seem to enjoy thoroughly. Hot Tomato Rasam was superb with pulp of tomato with decent level spiciness. Starters like Arbi Fry, Potato Fry and Chili Bajji’s were lovable with great texture, golden brown color and perfect crispiness Chilli Bajji’s were mind blowing with some filling, trust me it was yum! Kakarakaya was soft, filled with some peanut based stuffing and the best thing was it wasn’t bitter at all! Arbi Fry and Potato fry were too good again; it gave an authentic home food feeling. We have some influence of Andhra cuisine delicacy at my home, so I know most of the dishes which serve at Coringa. We all enjoyed the starters without any complaints. I heard about Dibba Rotti, but never got a chance to try. In Coringa I got an opportunity to try out this beautiful dish. It’s a pan fried rice based dish (like idli) with supreme level of crispiness and it just goes like that with Onion Chutney and jaggery. 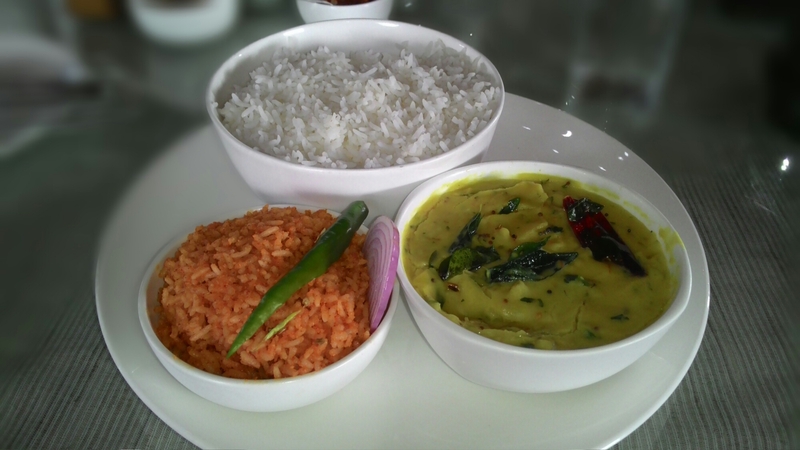 Most of the people might have tasted Andhra Pappu (Dal) at least once in any of the Andhra style restaurants but Mango Dal at Coringa was out of this world. Coringa makesthe most beautiful Mango Dal. It’s a combination of sweet, sour and spice. If you like spicy food, just crush the chili and have it with Rice. I was the one who finished it without leaving anything in the bowl. 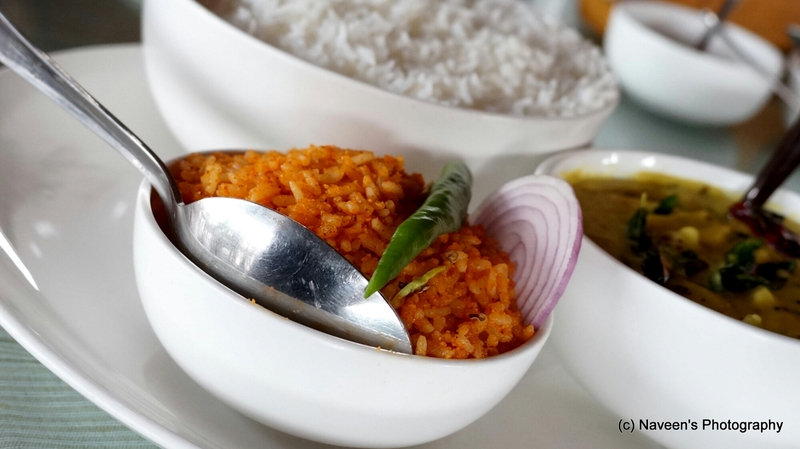 Kandi Podi rice is one of the signature dishes in Coringa and very light although it’s spicy. Kandi Podi (Gun Powder) is a most common classic Andhra recipe which is actually a flavorsome, protein packed lentil spiced powder. Must try dish for vegetarians! After trying all these I was totally full but will never say no if there is Veg Biryani in a Menu. Veg Biryani was good though, and found unique compare to the other restaurants,The Raitha which accompanied biryani was thick with tiny chunks of Onion and mild spiced. 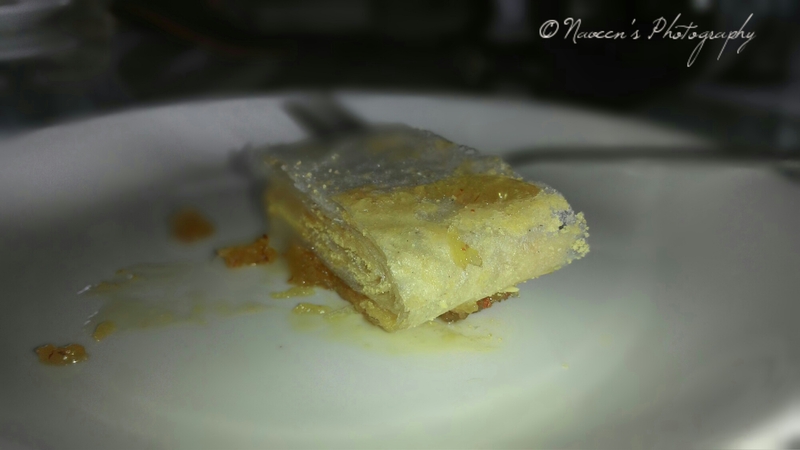 At last ended up with Poota Rekulu, this is an classic sweet of Andhra Pradesh and not so easy to prepare. I have tasted in so many places with sugar powder as filling and always love it. At Coringa, its a special affair again. They’re made with a stuffing of Jaggery powder and Cashew Nut filling. Poota rekulu is served over a bed of warm mix of grated coconut and jaggery, It was so soft that it just melted in my mouth. What stands out in Coringa is the Traditional food. We were told that recipes came from one of the partner’s Mother!!! 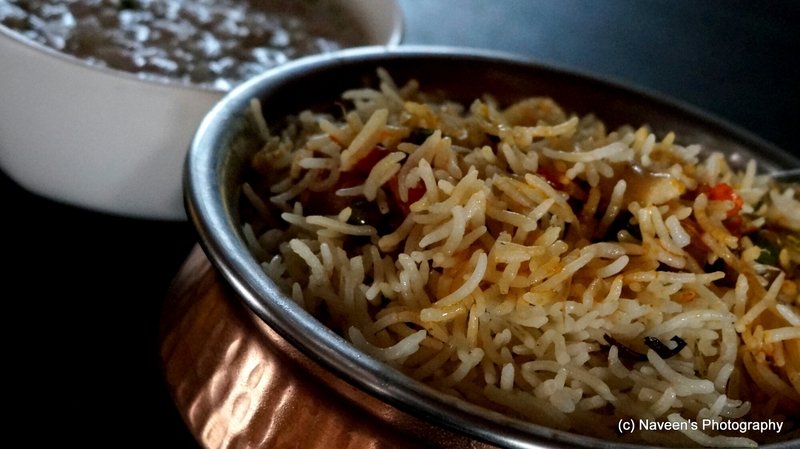 Previous Post In Love With It – BYLI – Bet You Love it, Kalyan Nagar, Bengaluru. Next Post New Add-on to Exclusive Roof Top Experience – Skylit, Citrix Hotels, Cunningham Road, Bengaluru. A well written blog that took us through the luncheon experience. The pictures compliment the write up. Well done Naveen!! !